For any small software company, integrations are a painful balancing act. On the one hand, there could be a huge potential upside from the partnership, and your customers may be begging for you to integrate with the other products they use. On the other, you’ve got your own damn product to focus on. Every hour your team spends building integrations with other services is an hour they’re not spending fixing bugs or improving your core product. Our approach to choosing partners and executing on the integrations may not be as refined as some of the companies out there who have launched dozens or hundreds of them, but we’ve learned quite a bit along the way, including a few important strategic elements that have helped us launch bigger, convert better and get more out of our investment into integrations. 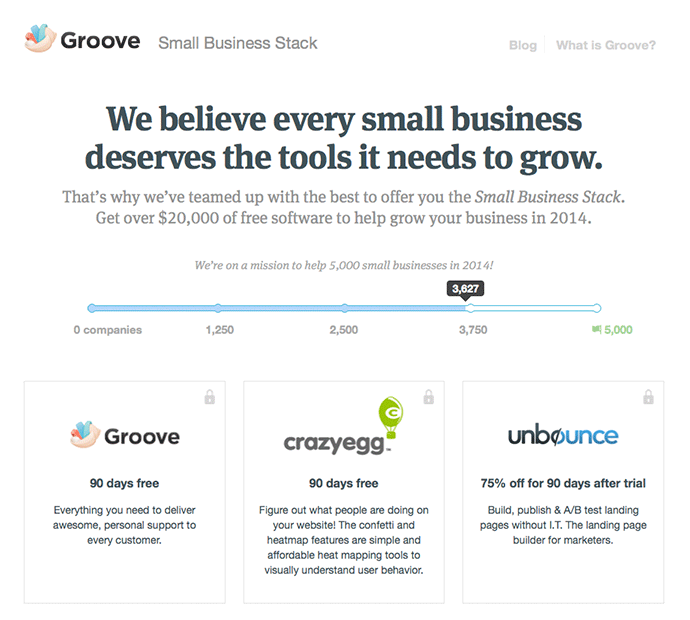 A few years ago when we first launched Groove (before the birth of this blog), our customers were already asking for integrations with the other products they used. It makes sense: no business app exists in a silo. We use nearly two dozen apps at Groove alone. If we’re choosing between competing apps and one of them already has built-in functionality to work well with our other products, that’s a big win for us. It means that we either don’t have to spend development resources connecting the apps in the background, or that we simply get a value-add that wasn’t there before. For example, I love Hello Bar’s integration with Campaign Monitor that makes it easy to add new subscribers to the right lists without doing any custom coding. That makes less work for us, and it makes HelloBar a no-brainer. That’s the same effect we’re trying to achieve with our own integrations. Slack has more than 11,500 business customers. Sure, some of them probably read this blog. But I’d be willing to bet that many, if not most, have either never been here, or have stopped by and never come back. When Slack announced the integration, it gave Groove exposure to an entirely new audience of ridiculously qualified leads — who already use a product that we integrate seamlessly with — that couldn’t match our target personas more exactly. Today, we’re seeing more and more of them become Groove customers (more on that later). There are a number of benefits that don’t necessarily fall into the trackable “ROI” bucket, but that I have no doubt bring Groove new customers every day. Building relationships with key people at other companies — as you do when you’re working on an integration with their product — has been an invaluable asset to me. It’s helped us launch big industry initiatives like the Small Business Stack and secure standing open invitations to guest post on influential blogs, among other opportunities. It also helps to change the perception of Groove; when people see our name next to huge players like HipChat and Slack, they make an association in their minds that puts us in the same league as those much bigger, more successful companies. That’s an instant win for establishing credibility and trust with new prospects. With thousands of SaaS apps on the market, picking the “best” ones to build integrations for isn’t exactly easy. The process isn’t a cheap one: it takes many hours of developer time to build and test, many hours of marketing time to prepare and execute on the launch, many hours of support time to help customers who have questions about the integration, and many hours of my own time to work on our relationship with the partner and manage the project. When all is said and done, it’s easy to run up a five-figure cost for a single integration. That’s why maximizing the upside is absolutely critical. 1) Would It Significantly Increase the Value of Groove to Our Customers? Far and away the most important point. 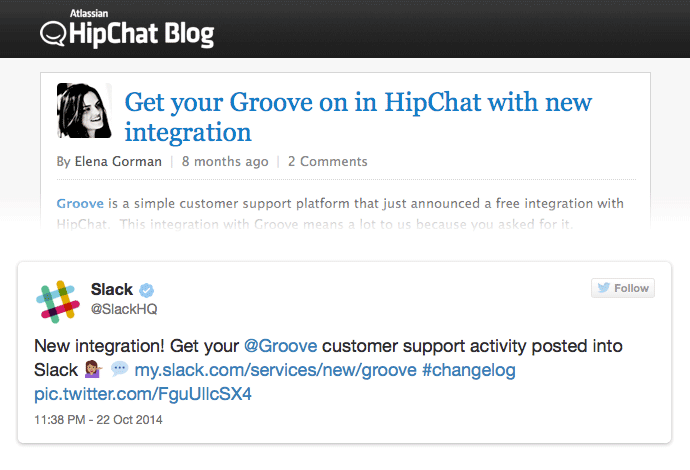 Would the new integration make Groove much more valuable to new and existing customers? Off the bat, this eliminates 95% of the possible integrations we could consider. There are many products that our customers use that they’d never get value from connecting to Groove. On the other hand, there are product integrations that make both products much more valuable for our customers. 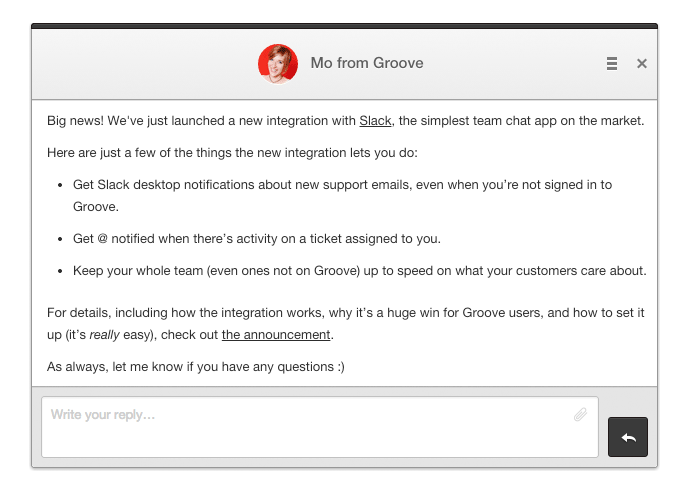 Slack is a great example: we’ve often heard from customers that they’d like desktop notifications for Groove messages. 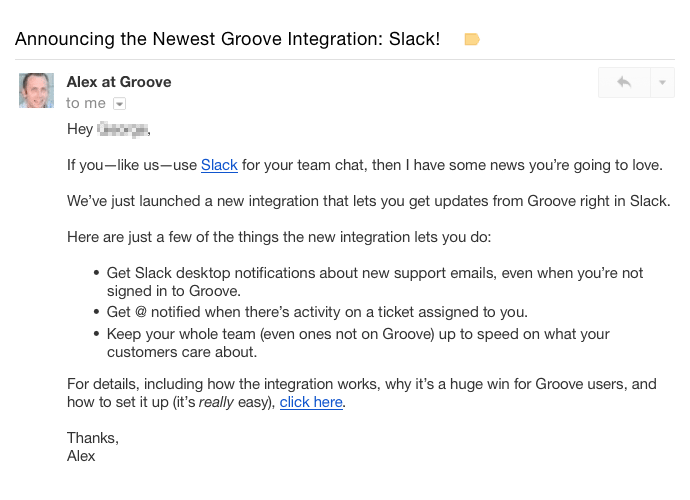 The Slack integration — which pushes notifications about new Groove activity to a user’s Slack room, makes that possible. 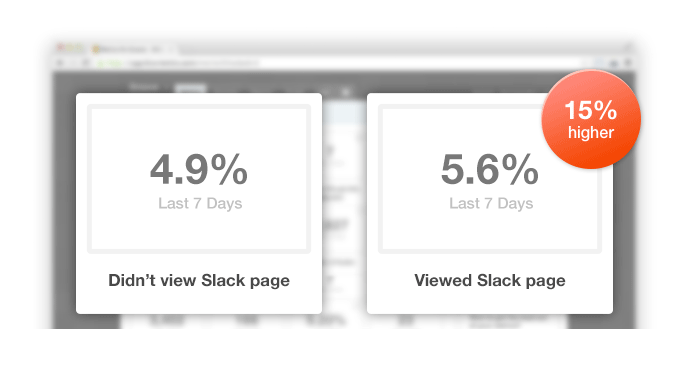 And on the Slack side, many users spend their entire day in Slack. They’ve built a habit of doing much of their communication in the app, so being able to get their support emails in Slack — and not having to always be logged in to Groove — is a big bonus for them. That’s the sort of symbiotic value-add we look for as we build our integration roadmap. 2) Do Our Customers Actually Want It? We track customer requests closely so that we can make the best decisions about our roadmap, and integrations are no exception. When I spend time talking to customers, I make it a point to ask what other products and services they’re using. Whenever we get an email requesting a particular integration or feature, we log it in Trello with a link to the request. And we’ve even been tipped off to customer interest by looking at what our customers search for in our knowledge base. Ultimately, we don’t want to build anything that our customers don’t want. 3) Are the Products, Brands and Markets Complimentary? There’s a ton of overlap between the personas that Groove is right for and the ones that Slack is right for. Small and growing teams, often startups, SaaS and eCommerce companies, are a big part of Slack’s user base, and Groove’s as well. In contrast, there could be a lot of value-add for both products if we integrated with an enterprise-level CRM but it wouldn’t be all that useful to our customers, who are way outside of that market. Shared values is another important condition. As fluffy and meaningless as it sounds, it has plenty of marketing value; Slack markets itself as a tool to make work life simpler, more pleasant and more productive. Our positioning is quite similar, and that overlap makes an integration much more appealing to our shared customers. 4) Does the Company Want to Build a Relationship With Us? Some companies are much easier to work with than others. A company that puts effort into building an open API (a priority for us right now) makes it easier and more inviting to build an integration with. And a company that’s willing to “bring it” and work with us to build and promote the partnership is much more interesting than a company who will never mention Groove to their customers. In both of our big integration launches this year (HipChat and Slack), the companies were incredibly cooperative and helpful in spreading the word; something we discussed and agreed on before we started the work on our end. When our Slack integration was ready to roll out, I invited the users who had specifically requested it in the past to be part of our initial test group. This helped us not only kick the tires, but build a small team of evangelists who would later promote the integration. After a couple of weeks of testing, we felt confident releasing the integration to all of our users. We built a targeted landing page that would explain the integration to our customers and why it would be valuable to them. 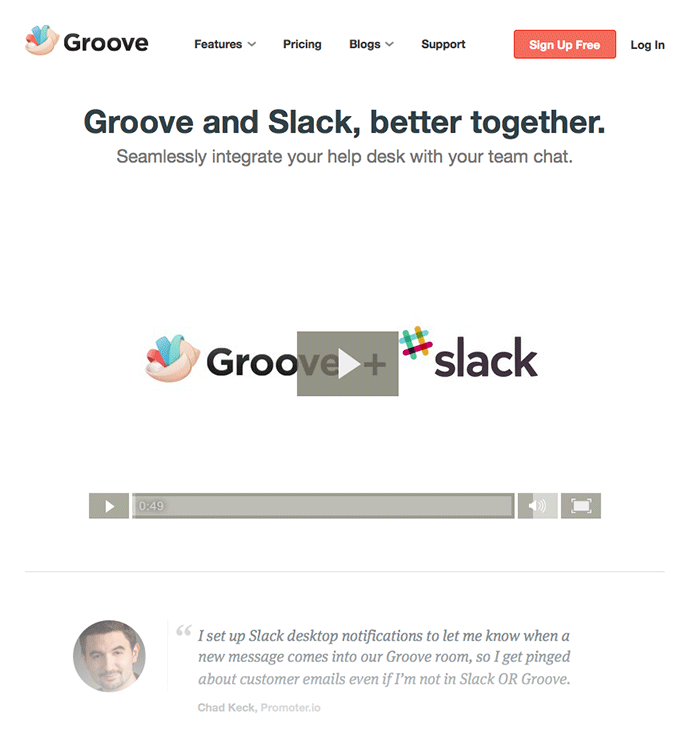 While we worked on our own targeted landing page, we built a similar page for Slack users, explaining Groove and why the integration would be useful to them. We also worked with the team at Slack to coordinate the promotion efforts, and their Twitter announcement drove a couple hundred clicks. While Slack already has dozens of integration partners, they couldn’t have been more helpful and supportive for our launch. Especially since we’re still “new” at launching integrations, we wanted to make sure that we tracked our metrics as closely as we could to improve our strategy and processes. 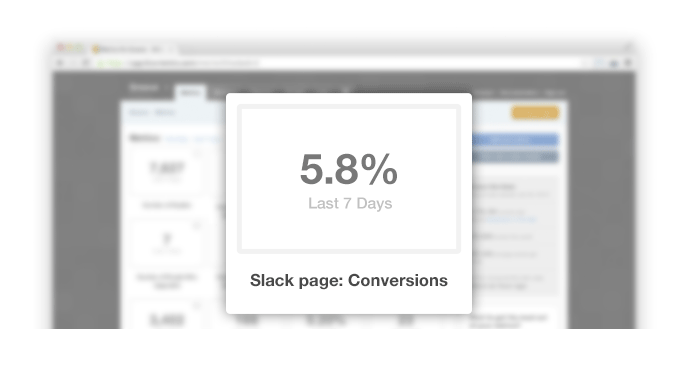 The landing page for Slack users, while the traffic hasn’t been heavy, has converted visitors to trial users pretty well at 5.8%. 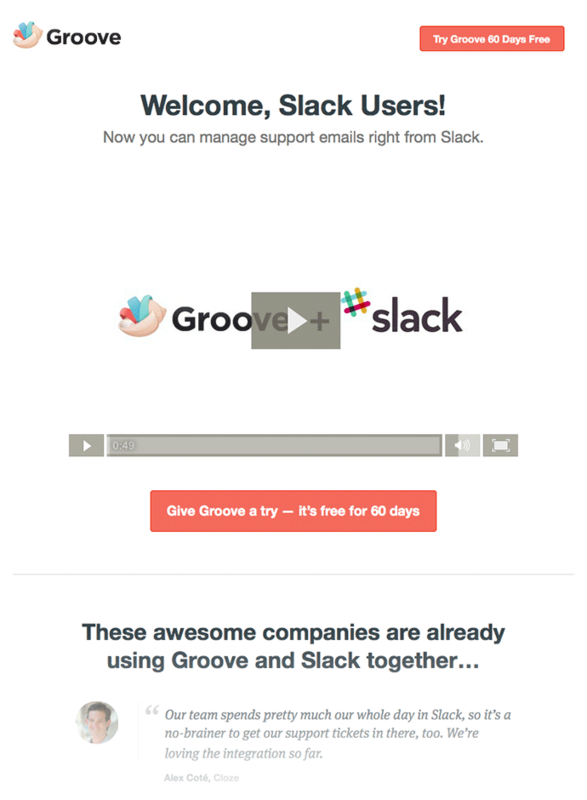 And from tracking our funnels in KISSmetrics, we know that visitors who click on the Slack integration page link on our marketing site are 15% more likely to sign up for a Groove trial. 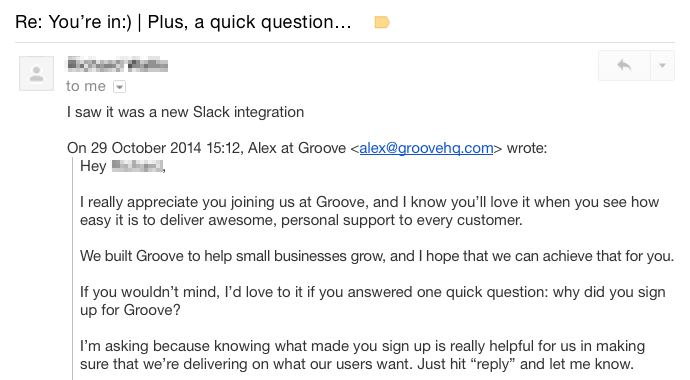 We’re also seeing the effects of the integration as we ask new customers why they signed up for Groove. We’ll continue to track our performance to help us evaluate future plans. While we’ve gotten our first two “big” integrations under our belt, we still have a lot of work left to do. While we have a roadmap with possible integrations, we’re doubling down on gathering customer input to inform our decisions. 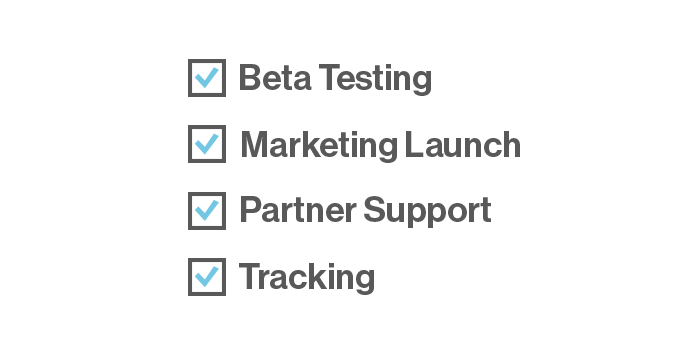 Next week, we’re deploying a survey to our customers asking them which integrations they’d like to see next. Zapier is a platform that makes it easy for users to “build their own” integrations betweens the apps they use. They already support more than 300 SaaS apps, and adding Groove to the list would help us point customers to an easy solution, especially when they’re requesting integrations that don’t have enough upside to make sense for us to spend time on. We want to give other companies the opportunity to integrate with Groove and help us deliver more value to our own customers. That’s why building an open API is high on our list of priorities. We’ve just hired two new developers, and I’m excited to see that tackling that project is finally within reach. 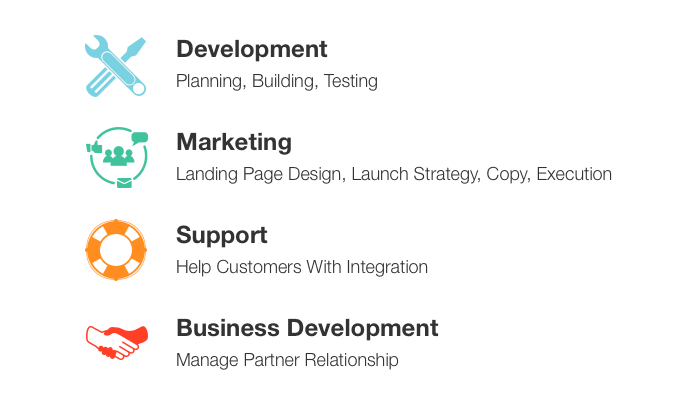 Partner integrations are only a small part of our growth strategy, but they’re an important one. We’ve seen great benefits from building bridges from Groove to other complementary products. Our strategy is far from perfect, and it’s certainly not “final.” But it’s done well for us so far. I hope that this look into how we approach and execute on integrations will help you make better decisions for your own roadmap and business.